My running of Axles and Alloys (aka A&A) at Recruits convention was a success. I had 13 slots available and 12 grown men answered the bell to play this little slice of chaos in action. If the amount of laughs and whoops when things went sideways (literally and figuratively in this game) were indicators of fun, then fun was had in spades. I want to thank Mike, Lee, Andy, Ken C., Ken V., Joel, Hal, Max, Scott, Jamie, Paul and Pat for playing. The plot (as written for the convention's website and program): "Fuel. Fuel is everything. It's so rare, you'd do practically anything to get it. When you hear there's an entire truck filled with fuel heading through the Dead Zone to Summit City, you round up your posse and head out to intercept. Problem is, you're not the only gang with that thought. Who will leave the Dead Zone with the fuel, you or another gang? Will the fuel truck survive to deliver its goods? Not if you have a say in things! 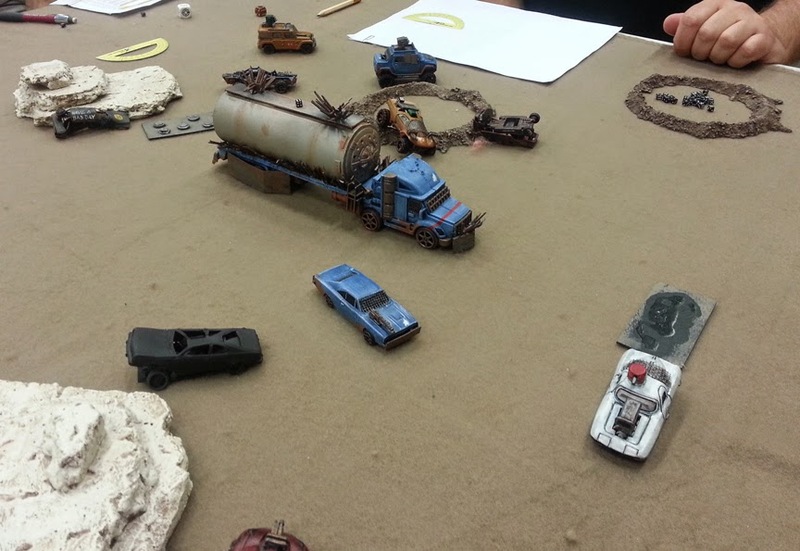 Axles and Alloys is a quick-playing, over-the-top sci-fi vehicular combat system based loosely upon Full Thrust rules. 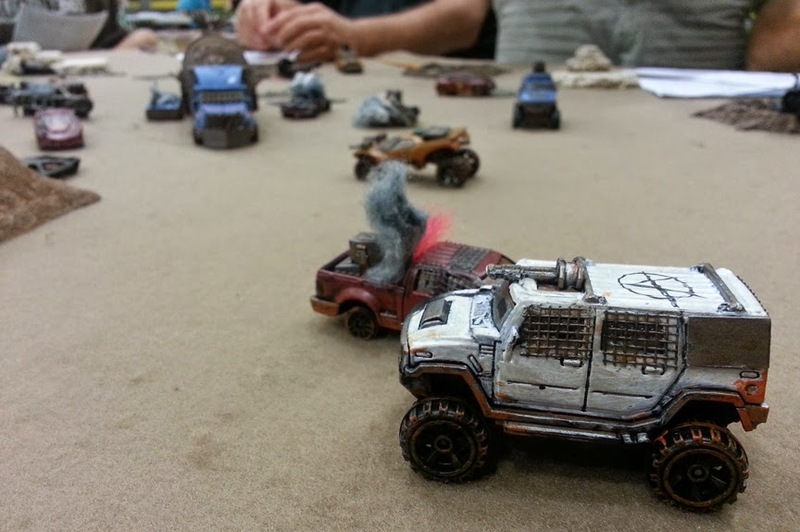 Think Mad Max meets Car Wars, but with simpler rules." The board, sans vehicles, filled to the brim with quick reference sheets and high hopes. The Blue Angels started strongly, as the gangs pretty much started on the other side of the table. 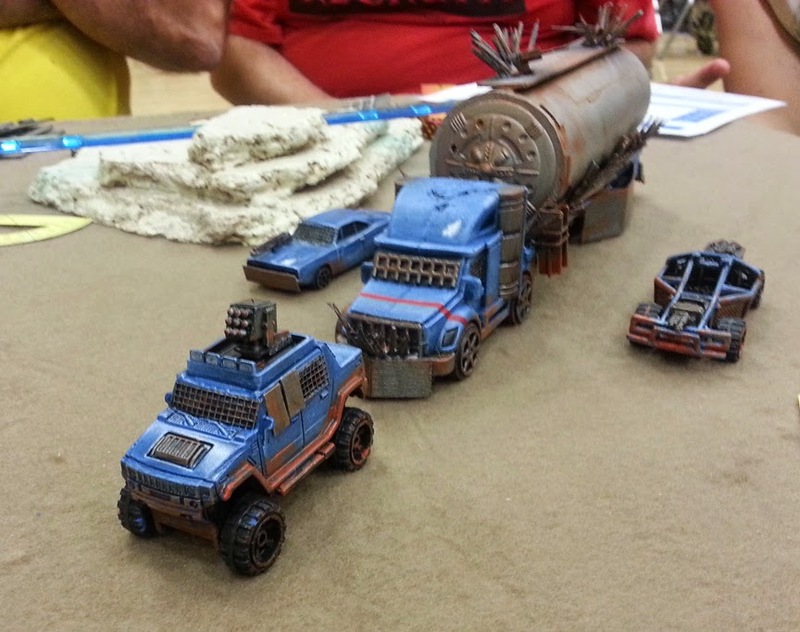 There was one group that entered from the same side of the table as the convoy and they tried to take full advantage of this, but the heavy weapons on top of Motherload kept them at a distance. The Blue Angels (from L-R): Tall Boy, Lead Sled, Motherload and Flash. Would they successfully get the fuel to Summit City? 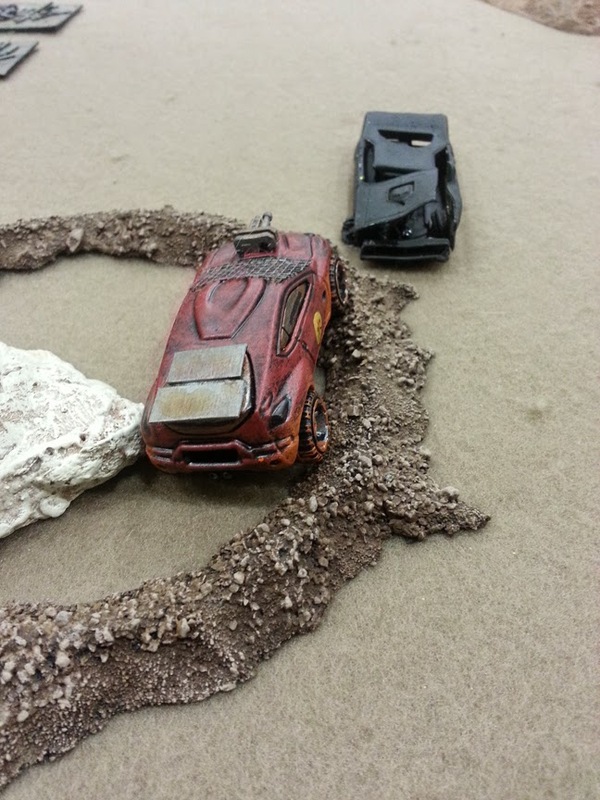 There was one Blood Runners speedster car that finagled the ultimate "tight squeeze" maneuver in between a deadly rock formation and a burned-out husk of a car. With his sport suspension, the rough terrain wasn't an issue. That was the first little "test" by the players of the game's coolness factor. Needless to say, it passed. As the game proceeded, it became clear to me that these players would stretch the game's rules to their full extent and create a totally different experience than my group's play test. For one thing, droppers were heavily used, resulting in fantastic skids, wrecks and much laughter. Let me add that these guys were great players. They had most of the rules down within one turn of play and were calling out speeds by themselves. I was relegated to answering rules questions and watching the mayhem unfold. 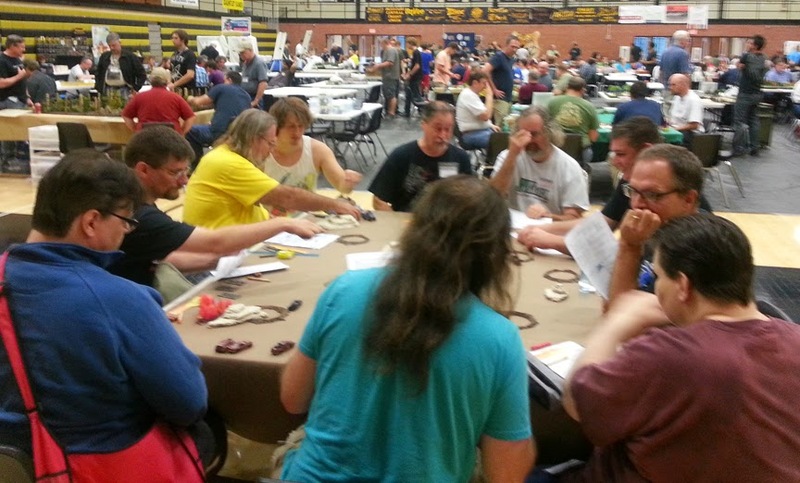 Perfect for a convention game! The first vehicle to zip across the front of Motherload and drop some mayhem was Blowback, a straight-line, nitro-burning speedster with a turret gun. He set the tone for others as for how to stop the fuel truck from reaching its destination. After the above aerial shot was taken, Blowback, already weakened by some gunfire and traveling well beyond what would be considered "safe", lost control in a turn, flipped and burned. Another blazing fast car dropped spikes in front of the big rig, effectively ruining its ability to turn. It moved so fast that my camera missed it entirely! Fortunately for Big Blue, it was already pointed in the right direction to safely leave the board when it ran across the spikes. Turned and barely avoiding the oil slick, Motherload was then confronted with another problem: his own outrider was in the way! There was a lot of speculation on whether Lead Sled would be able to move out of harm's way before the big truck t-boned him! It did, but there was a lot of joking as to what would happen if it didn't! On the other side of the table, the heavies of the Anarchists and the Blood Runners were approaching the slowest collision ever recorded. Hanging back in order to cause more chaos for Motherload later, they met in a non-rush of metal and fury....which is to say they barely bumped each other after shots were exchanged. Literally speeds 2 and 3 (10-15 mph), respectively. 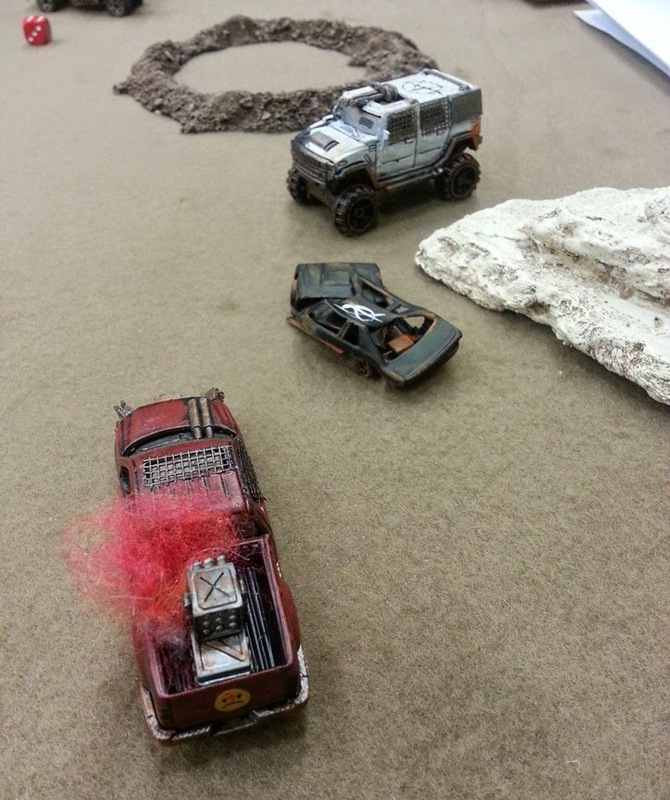 In the end Chopstick, the Blood Runners' heavy, was soon on fire and taking more damage every round. 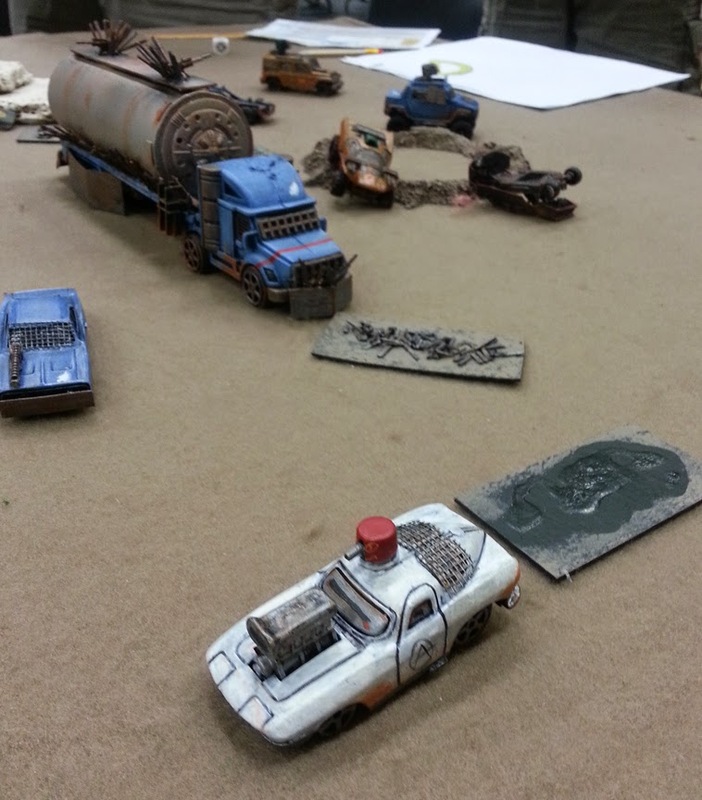 The driver succumbed to the flames and wound up doing a wonderful job as a roadblock to Motherload's escape off the board. Motherload went up like a fireworks factory, killing anyone within 12" of the blast. The table erupted in laughter. It didn't matter to them that they all "lost". 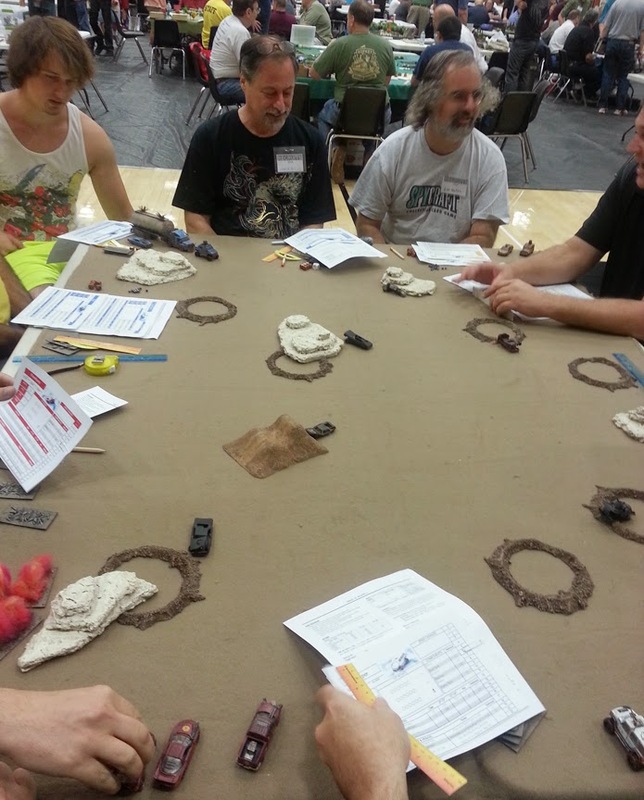 As one fellow put it, "it's all the crazy, chaos sh*t you see happen in the movies, but on a gaming table!". Sure! Motherload: Ultra heavy truck, 6 Capacity, 0 Rerolls. Max Spd: 18, ACC: 3, DEC: 3, Turns: 1. 2 Heavy Cannons, placed on top of the tank, each facing a different side direction (i.e., left & right). They couldn't fire under 6" from the truck, as they couldn't lower their gun sights that far. I gave it both defensive and offensive ram plates. 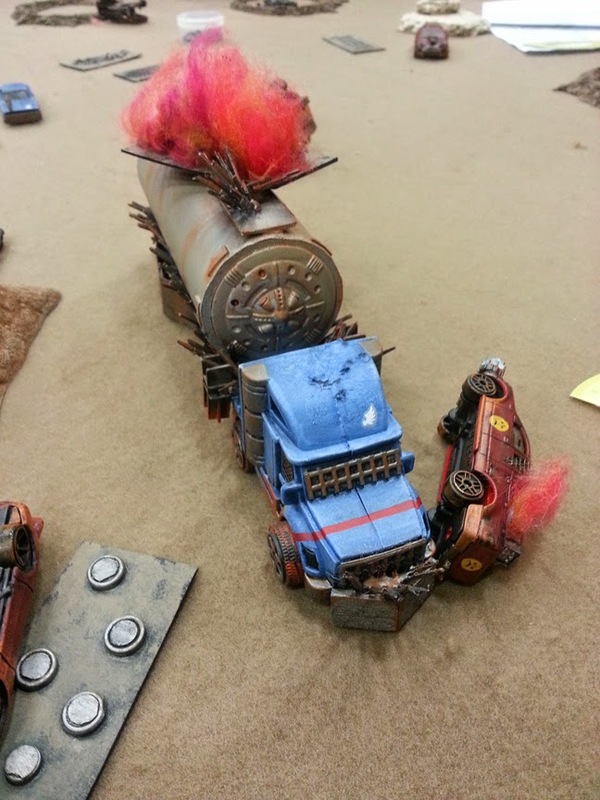 The fuel canister (payload) on the back had special rules, too. 1st hit = 1 fire. 2nd hit = 3 fires. 3rd hit = BOOM! Enjoy! Yes, just one point more per line than a heavy.